This was an easy pattern to help use up some Christmas fabrics....free quiltalong, snowflake, on the Bernina blog. I wanted to try a batting that would have a little more loft than the cotton batting I usually use, so I purchased Hobbs PolyDown. It did give me a higher loft, but I did not enjoy working with it all....maybe I needed to adjust the tension or something, but I feel like my FMQing took 5 steps backwards! I couldn't control the quilt as I quilted....or something! It has a pretty drape to it, but it's not as warm as my other lap quits. I learn new things with every quilt I make! 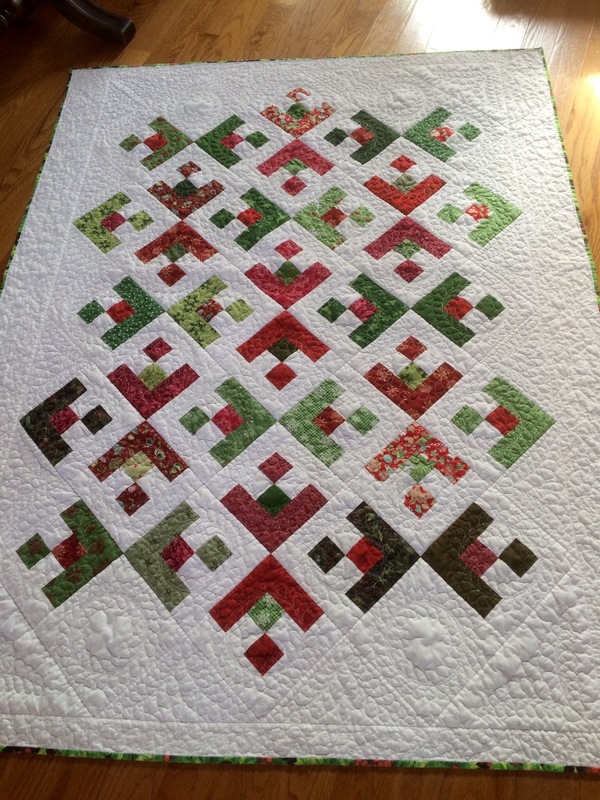 Love the quilting and the Christmas colors. May I ask what size the 4 patch blocks are please! I love your fabric choices. Love your quilt. I saw that pattern on their website and thought it was "nice", but would probably not make it. Seeing yours makes me want to start one right away. Maybe I can start one after I finish my holiday sewing. Sorry about your difficulties quilting this but it is still a beautiful quilt. The colors, fabrics, and design are just wonderful. Life doesn’t get better because you ignore reality. It gets better when you accept reality and learn from your mistakes. I love this quilt but wonder if I can make it and quilt it with loops or stipples? I can't do the beautiful quilting as you did but really like this quilt. I gave away what I had of Hobbs Poly Down since I started using Hobbs 80/20 when they first introduced it at Quilt market many years ago. Poly just wants to shift on you, cotton doesn't. Last edited by ManiacQuilter2; 11-29-2015 at 12:38 PM. Thanks for posting the link, Maniacquilter! Fabstripper, you can quilt this any way you want to quilt it! I believe the sample quilt was done in an all over stipple. I wanted to practice feathers...and after doing a few of them with this batting, I was ready to throw in the towel! The borders have a small ribbon/ loop with snowflakes thrown in...I couldn't bring myself to do anymore feathers! My DSM made me promise to never use poly batting again! 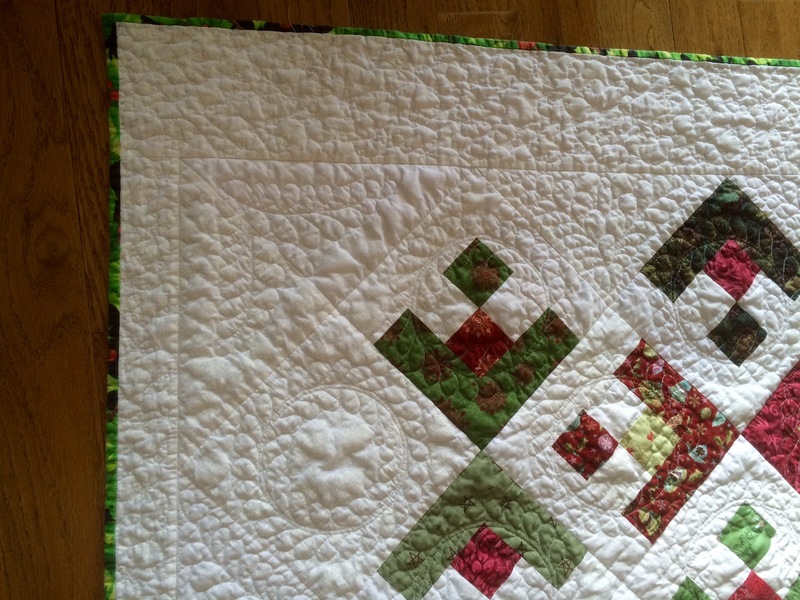 Very pretty quilt, and your quilting is lovely! Your fabric choice for this pattern is fabulous. Love the quilting too. I like this. Using Christmas colors without it looking overly traditional. Great job. pretty and very good quilting. Very pretty...your quilting is terrific! I could also picture this done as a Summer theme quilt, because the pattern resembles fish to me. What a lovely quilt. Thanks for the tip re: the lofty batting. I've wanted to use something loftier a few times but haven't. You did a wonderful job with this quilt. it is beautiful and interesting. Like most things, if it isn't broke don't fix it. Go back to using the batting you normally use. and get a slider. it helps with the FMQ. Yours turned out much prettier than the one I saw on the Bernina site. Your fabrics are bright and cheery and although you say you had a difficult time quilting, it turned out lovely. Great job! Very pretty! I think your quilting is great! Very pretty quilt. I like that pattern - a good one for scraps. Thanks for sharing.